Living on the Blue Ridge of the Southern Appalachian Mountains is a blessing. Multiply that by the abundance of medicinal herbs that also live here, and what you have is a rich haven for herbalists. Having survived the advance and retreat of glaciers during the last ice age, the Appalachians, which are some of the oldest mountains in the world, became a botanical treasure. 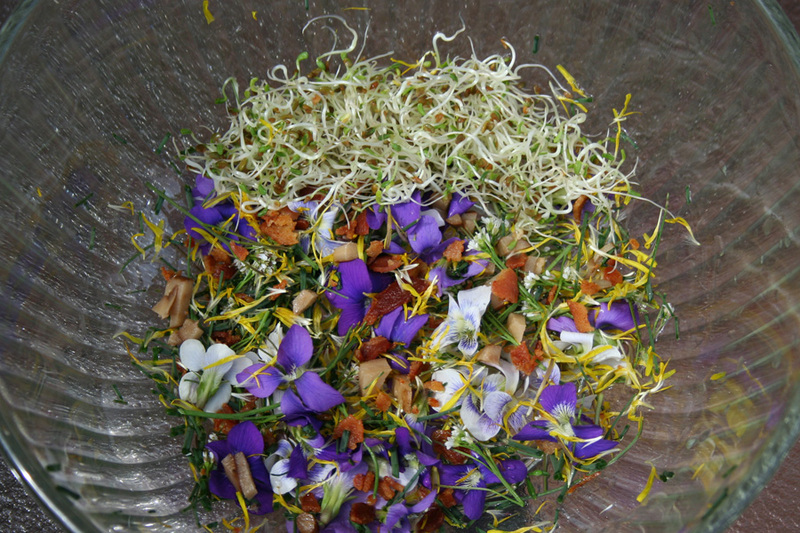 It is here that I am blessed to study, gather and prepare herbs, and practice herbal medicine. I have been coming to these Smoky Mountains of North Carolina for as long as I can remember, and living here full time for the last sixteen years. Like me, lots of folks are finding their way to the mountains in search of a saner, healthier lifestyle, and communities in which to raise families and grow old. Unfortunately, more people also means more scars upon the land. While it is my belief that there is enough for everyone, I also believe that we have a responsibility to future generations to be good stewards of the land that feeds, sustains, and heals us. For this reason I would like to share one of my harvesting expeditions. 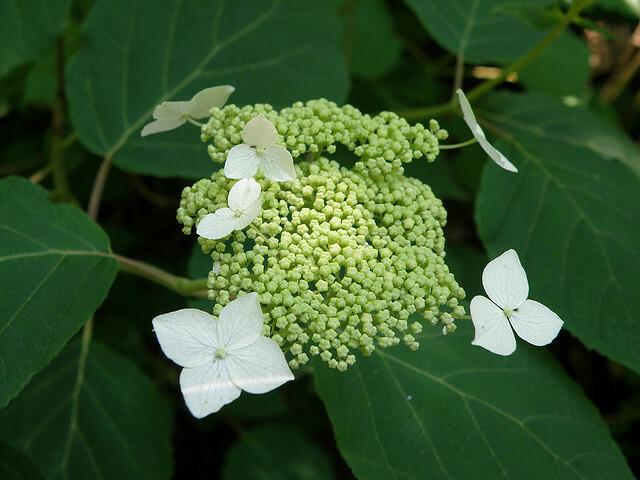 Wild Hydrangea (Hydrangea arborescens) is an attractive shrub but nowhere near as flamboyant as her cultivar cousins that are cherished as ornamentals. 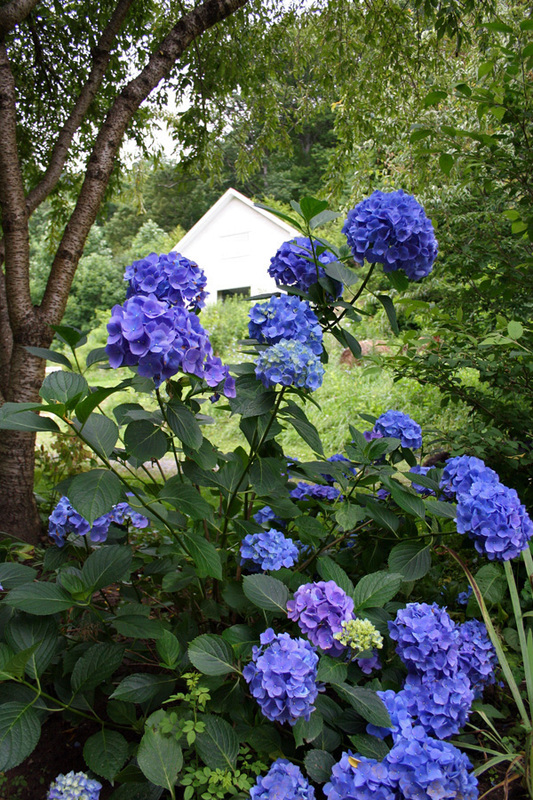 Wild Hydrangea is native to the Southern Appalachians, which has allowed me the opportunity to get to know it more intimately. What I discovered is an excellent remedy for inflamed or enlarged prostate. While not a “prostate” herb, per se, because herbs are not so easily pigeon holed, it holds a genetic knowledge of its lineage that stretches back for millennia. This brings forth many healing potentials and we are still discovering them. To simply call it a prostate herb would not give it the credit or respect that it deserves as a wise elder. The study of an imbalance in a person, such as a prostate issue, is called pathophysiology. Modern Medicine studies pathophysiology from the narrow lens of the reductionist viewpoint because the medicines they use are very narrow in action. 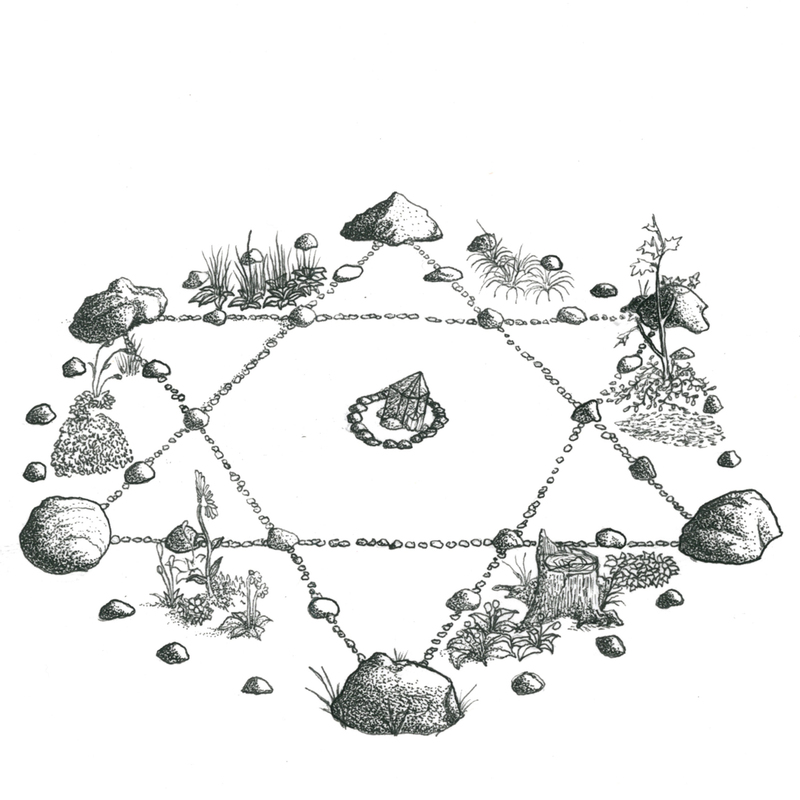 Herbalists have a more broad perspective because the plants they use are broad acting and have many actions. This broad energetic perspective or holistic view naturally leads to searching for patterns. Energetics is another way of saying, patterns of organization. Patterns of imbalance within our body mirror the patterns found in nature: heat/cold, dampness/dryness, contraction/expansion. Self-organization into ordered patterns is ubiquitous in nature. Studying and learning how to read the patterns will help us understand that healing takes place in the context of relationship. Plants are sentient beings that communicate through biochemistry and the understanding of this chemical language is in its infancy. 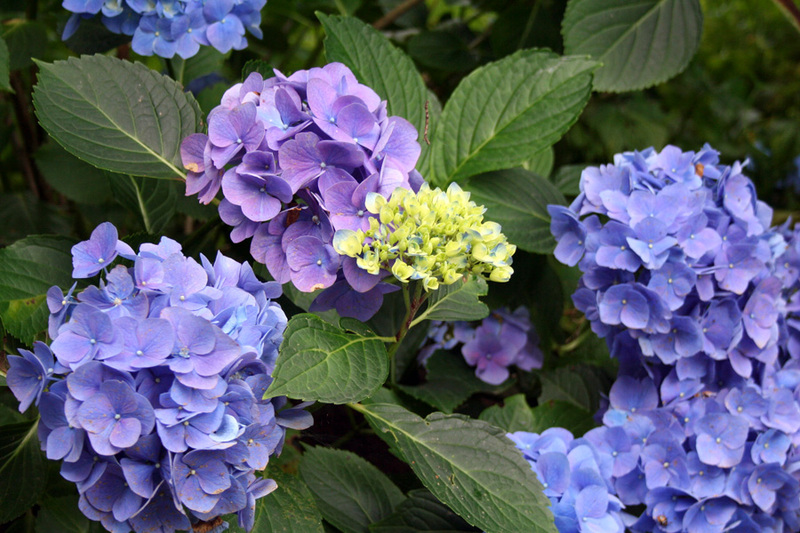 Energetically, Hydrangea is cool and neutral. 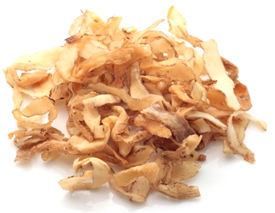 Its herbal actions are diuretic, anti-lithic, analgesic and anti-inflammatory. It is useful for various kidney, gallbladder and urinary tract problems. My first trip into the woods (many years ago now) to identify and harvest Wild Hydrangea was on a Full Harvest Moon with my mentor; herbalist, Patricia Kyritsi Howell. It was the perfect time to go digging for Hydrangea’s roots. Carrying a basket, canvas bag and some hand clippers we headed out into the North Georgia woods in early fall. 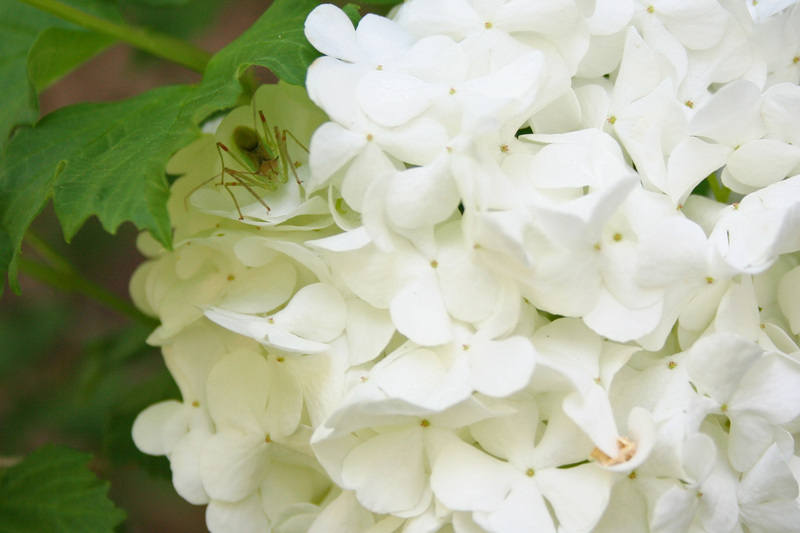 The white flower clusters that bloom May through July were faded and brown, but still clung to the shrubs that grow between four to six feet tall. Varying numbers of showy sterile flowers may be present and the cultivated forms may consist of nothing but the showy sterile flowers. The opposite, broadly ovate and sharply toothed edges of the leaves, which are slightly paler underneath made identification easier in the absence of bloom. The stem bark has a tendency to peel off in thin layers, each a slightly different color and thus the common name, sevenbark. 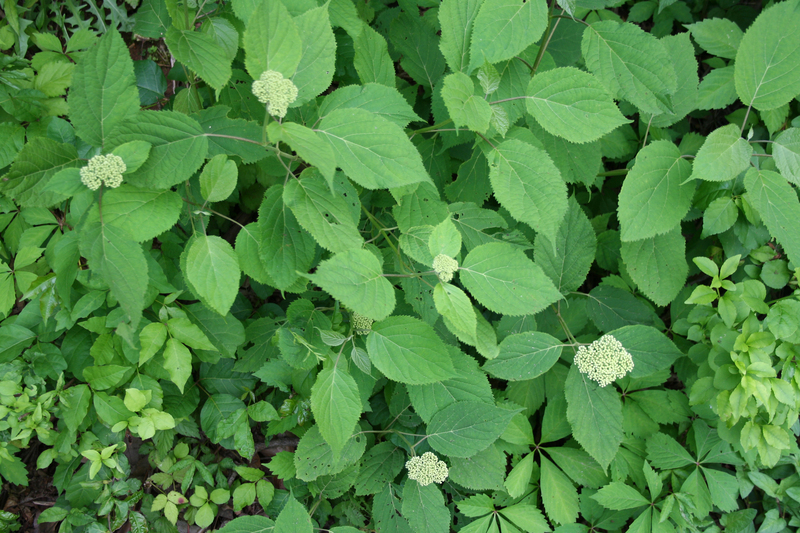 Patricia writes about Wild Hydrangea in her book, Medicinal Herbs of the Southern Appalachians, and I was thrilled that she had agreed to personally introduce me to this native plant. There is nothing like a personal introduction. As we walked through the woods she pointed out a few shrubs that were growing on a steep embankment. Getting to them would be difficult. Following Patricia’s lead I clamored up the bank, digging my heels into the soft deciduous dirt and began to dig. This was no easy root to free from its tenacious hold. I dug, sweated, pulled and cut until I held the most amazing rhizome and wildly branching roots in my hand. I filled the gaping hole that remained with as much dirt and leaf litter as I could manage and clamored back down. Looking up at the embankment where I had just been perched, it looked like a bear had been digging up there. I had taken the root of one of three Hydrangea plants that grew in that spot, knowing the importance of leaving enough to ensure continued propagation. Then we decided to climb up to the ridge above the embankment to continue our search. I thought it might be easier to dig from above rather than climbing up from below. Not far from where I had dug the first Hydrangea I saw another small grouping. In the end I would dig three roots, but not before I climbed down over the edge of the bank I had previously climbed up. While hanging off the side I lost my footing with nothing to hold me but my body pressed against the loose, humus rich soil and one hand clinging to this small, but very deep root. I looked down and realized the slide and tumble to the bottom would not be pretty. I turned back to the root that was holding me up determined that if I was going down, she was going with me. So I dug my heels in deeper, freed the root from its tenacious hold, and managed to grab a vine and pull myself up just enough to get one foot in the hole left by the root, enough to propel myself up over the top of the bank. I was very grateful that I didn’t crash and burn. Life, after all, is an adventure. This gave me a deeper appreciation for the roots of plants that hold and support the soil and its microorganisms on steep mountain slopes. My clamoring had left the mountainside unmistakably vulnerable to erosion even though I had done my best to fill in the holes. We should never underestimate the impact that we have on natural systems when we impose our needs. May we always do our best to keep that impact to a minimum and never take it for granted. I thanked the rich soil beneath my feet and Hydrangea for her medicine root. Even if I hadn’t been totally spent by this point I knew that three roots were plenty. It was all I needed. Not taking more than we need is one of the keys to ethical harvesting. The week prior to this I bought some dried and sifted Hydrangea root from a wholesale distributor so that I could connect with the plant and have enough on hand for making medicine. But I also know that preparing wild crafted medicines from the area where a person lives is 1000 times more potent energetically than commercially prepared medicines. These roots that we had gathered would become fresh root tincture, started on the full moon and decanted on the new or dark moon — dark like the earth in which she grew. The roots would more readily release their medicine and active constituents during this phase of the waning moon. “So that’s all you need?” Patricia inquired. And my response was, “Yes, it is enough.” I had accomplished what I had come for: to feel, smell and connect with the medicine plant that was serving my clients. Sometimes healing takes a certain kind of aggressiveness, a willingness to go that extra mile, or climb that mountain. Patricia, then made a very thoughtful suggestion, “Add a little of the fresh wild root tincture to the commercial dried root tincture. It will remind her who she is,” and that this is where she came from. Headaches sufferers know that this is no way to live yet most don’t know the cause of their debilitating condition. I frequently hear “dehydration,” “too much sugar,” and “stress,” mentioned as common triggers. While dehydration may seem like an easy fix, many don’t understand the effects of long-term dehydration resulting from depletion of deep yin fluids. Making the effort to correct a yang driven, stress filled lifestyle doesn’t always come easy when living in a driven society. Headache powders and pills can keep us going most of the time and for those severe migraines, forced down time can result in loss of work and productivity. We frequently push ourselves to keep going even when our bodies are crying for us to slow down. This pattern, especially when reinforced with toxic mimics like caffeine, can be incredibly depleting. The question that comes to mind is: Why has so much value been placed on the human doing while neglecting the human being and at what cost? It’s a story as old as time, but that story is changing. The human potential movement has us demanding new answers and new solutions. The paradox is that answers have been here all along. They are no further than we are right now. We are standing on our medicine. Orthodox medicine considers the underlying cause of migraine to be unknown. What we do know, and what migraine sufferers are constantly aware of, is that there are triggers that generally precede the onset of a migraine headache. Headaches in general are the most common health problem and the most common side effect from prescription or over-the-counter drugs. All prescription medications are yin depleting, or in other words, drying to deep yin fluids necessary to not only cool the liver and keep it from overheating, but also to lubricate the entire body. In a society where it is easy to simply take a pill for a headache, we have not thought to differentiate between types of headaches as is done in Chinese Medicine according to the meridians and specific symptoms. Just like the Eskimo have many words to describe snow, there are many different ways to describe headache. The two most common types are vascular headaches (dilation of blood vessels) and tension headaches (muscle spasms). The most common triggers for migraine headache are stress (physical, emotional or mental) and fatigue. Traditional Chinese medicine (TCM) is an elegant system that describes patterns of disharmony through its Five Element Theory. We all know that stress affects hormones. In the energetic model of TCM the Liver, or the Wood Element, is largely responsible for regulating hormones. The Wood Element is responsible for holding and releasing substances at the proper time including hormones and emotions. Disharmony in the liver disrupts these processes and is almost always implicated in any kind of headache, especially cyclical or seasonal headaches. 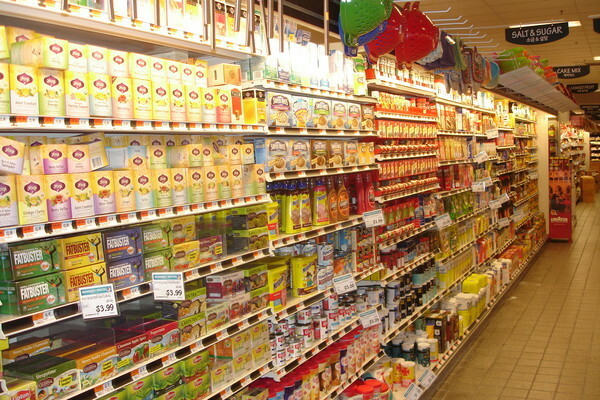 Other triggers can include environmental and dietary. In all cases, migraines are the result of disruption of liver qi. Relieving liver congestion is fundamental to improving headaches of any kind and can be achieved with proper diet, rest, nutrition, and nourishing and tonic herbs. Tonic herbs are herbs that are taken over a period of time usually from 3 months to a year. The longest lasting result from herbs is seen in their tonic ability to restore bodily systems. 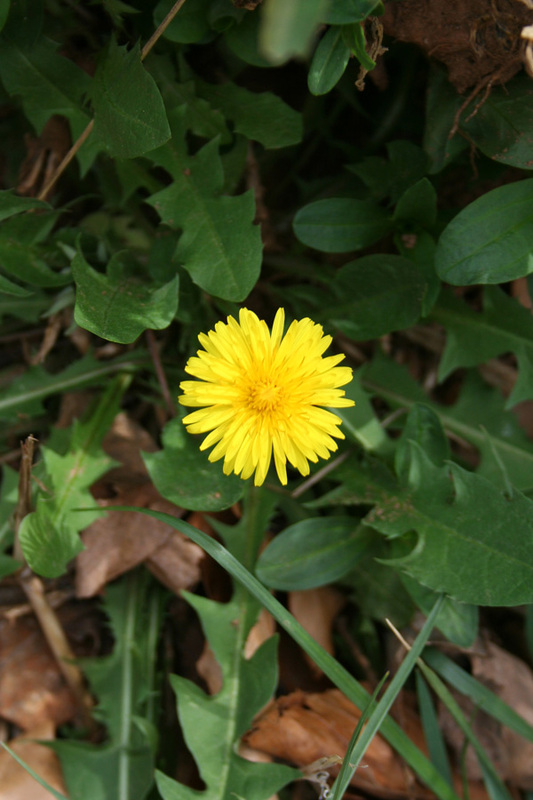 Some of the better know hepatic tonics include: dandelion, burdock root and yellow dock. Herbs that help to restore the yin fluids that cool the liver are: licorice root, reishi mushroom, schizandra, nettles and red clover. Eating a lighter diet that includes the bitter flavor and lots of spring greens with herbal vinegar dressing or fresh lemon is helpful in clearing liver heat (see recipe link below.) Full sweet (whole grains, legumes, sweet potato, winter squash, etc.) is harmonizing to the liver and increases liver qi (energy for the liver to do its work.) If you suffer with migraines you may do well to work with an alternative medicine practitioner (herbalist, naturopath, chiropractor, acupuncturist) who understands and uses these concepts in their practice. Adaptogenic herbs become a very important consideration when helping the body adapt to environmental and internal stress. They help restore balance and are another strategy to increase the body’s resistance to stressors and provide a defense response to acute chronic stress. Adaptogens are unique in their ability to restore balance of endocrine hormones, modulate the immune system, prevent and reduce illness while strengthening the body. In TCM adaptogenic herbs are considered qi tonics that strengthen and stimulate the immune and defense functions of the body. Some examples of adaptogenic herbs are He shou wu, Ashwaganda, Licorice, Schisandra and Reishi. By normalizing neurotransmitter levels in the brain adaptogens are used to prevent and treat neurological health problems including headaches and migraines. The more we wake up and realize that increased productivity actually comes from replenishing and nourishing ourselves at the deepest level the more we realize our human potential. Nourishment comes in many forms including wholesome foods and the herbs listed above as well as creative expression and a life filled with purpose and meaning. The good new is: There is hope for headache sufferers in every season. Read more articles like this from Thea Summer Deer and many other contributors by signing up for a Personal Mentorship with Susun Weed. Your subscription helps herbalists continue to contribute their knowledge and skill. Luckily, I was on a budget. So the one-arm-full-of-grocery finds that I brought home, while exotic, was not anywhere near as expensive as it could have been had it been purchased from my local health food store or online. One of those finds was dried polygonatum from China. 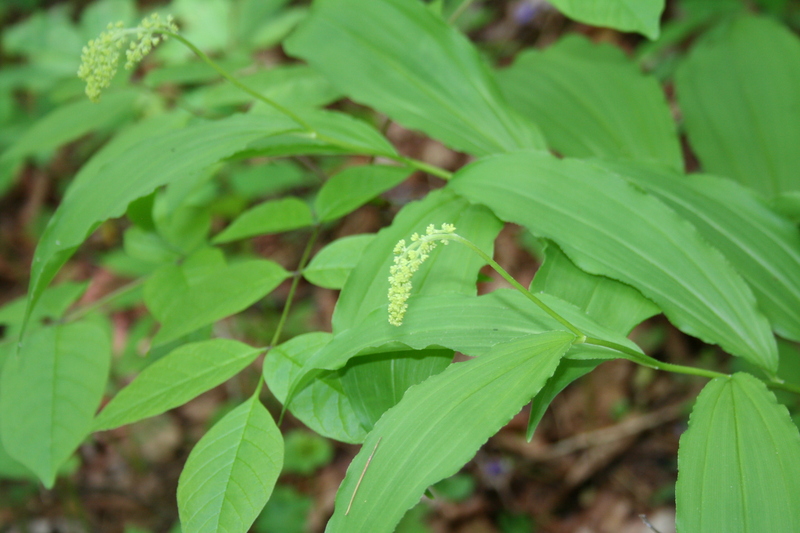 Polygonatum is a genus that contains approximately 50 species of flowering plants known as Solomon’s Seal, a common plant in these here Appalachian hills. Patricia writes about it in her book, Medicinal Plants of the Southern Appalachians. It is a perennial in the Asparagaceae family and in older classification systems, like many of the lilioids, was placed in the broadly defined lily family. Solomon’s Seal can be found blooming May through June – so this being May, I headed off into the woods. Some species are considered to be medicinal. The young shoots are edible and cooked like asparagus while the roots, which are the medicinal part of the plant are also edible. Berries, leaves and mature stems should not be eaten. Native Americans used it as both food and medicine, and early settlers valued the rhizome as a food for its starch content. Young shoots can be collected in the spring, not unlike asparagus, and added to soups and stews. Roasted roots can be ground into flour. 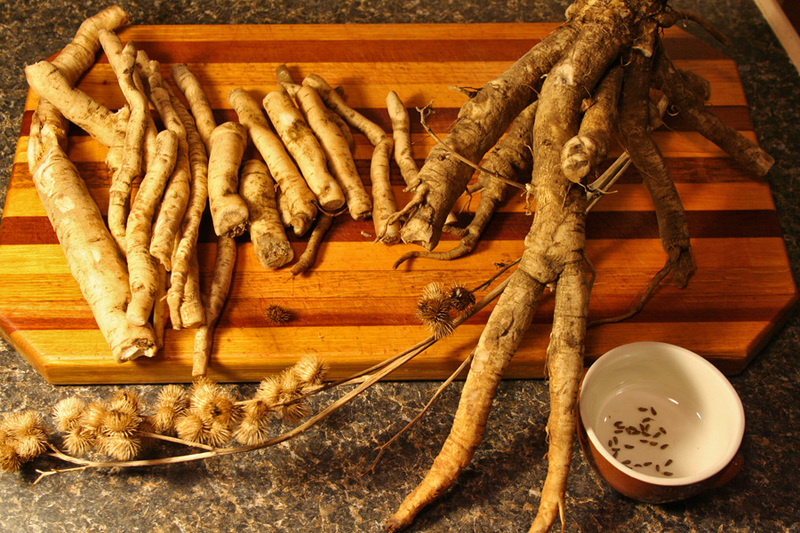 Solomon’s Seal can be ethically harvested in late summer or early fall by leaving a portion of the root intact. New shoots will grow from where the root was cut. An elegant Native American woodland plant, Solomon’s Seal likes to grow at the edge of moist woods. It will draw you in with its foliage poised along a gracefully arched stem, dangling pairs of creamy white, tubular fairy bellflowers, which are followed by attractive black seedpods. It is as if this plant were the entryway to a lesser-traveled path, lighted by breaking waves of fairy lanterns beckoning us to enter deeper into the forest’s hidden secrets. Odoratum (Europe) known as, Scented Solomon’s Seal and commutatum (a colonizing giant) are the two shade loving species most widely used in landscaping because of their beauty and attraction. The foliage is food for White Tail deer that will chomp it to just above ground level – and you should know by now that anything deer like to eat, is calling my name. There are many plants that are included in both the Eastern and Western herbal materia medica, though different species are used. The integration of Western and Chinese herbal therapeutics is an area greatly in need of expanded research and spearheading that movement are herbalists such as Micheal Tierra, author of Planetary Herbology, and Peter Holmes, author of The Energetics of Western Herbs. By coming into relationship with the healing power of plants we become empowered to be our own healers. 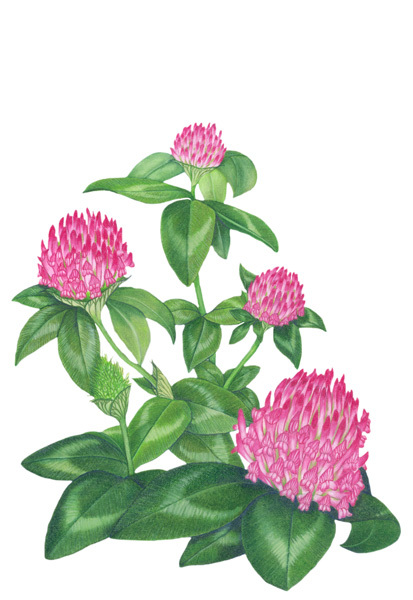 The key actions of Solomon’s Seal are: demulcent, expectorant, sedative and tonic. In Traditional Chinese medicine it is known as Yu Zhu. Tea from the decocted root soothes inflammation of the lungs and intestinal tract. Fresh roots can be applied to bruises and sprains as a poultice. 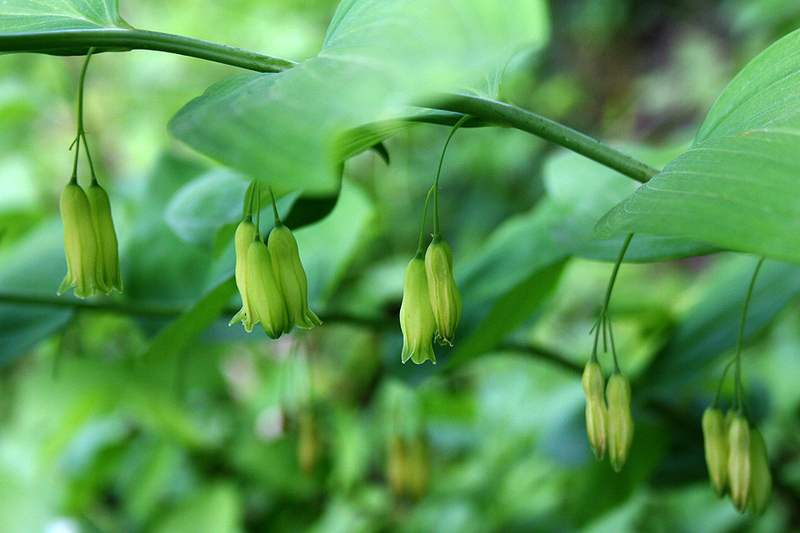 According to herbalist, Jim McDonald, Solomon’s Seal is a useful remedy for treating injuries to the musculoskeletal system. He has used it very successfully in tincture form taken internally to strengthen connective tissues and to treat broken bones, sprains, injured tendons, ligaments, tendonitis, arthritis and herniated discs. He states that, “Solomon’s Seal has the remarkable ability to restore the proper tension to ligaments, regardless of whether they need to be tightened or loosened.” One of the ways it does this is by its ability to nourish yin, moisten dryness, clear wind, and to nourish and moisten sinews. It has an affinity for the lung and stomach. 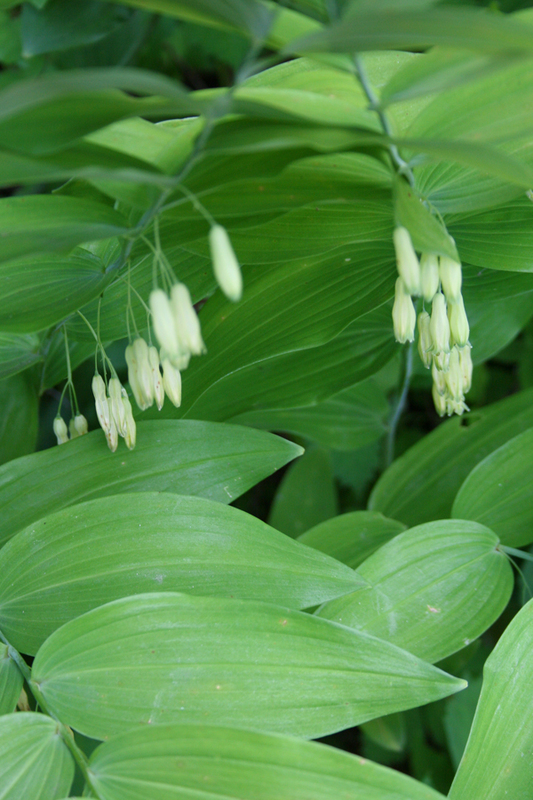 Historically Solomon’s Seal was used for respiratory and lung disorders, and as an astringent and anti-inflammatory. Yu Zhu is used in Chinese herbal soups to relieve dry throat or dry coughs due to lung yin deficiency. It is mildly cooling and nourishes the yin of the lung and stomach. It moistens dryness in the lungs and strengthens the stomach. It requires a long cook time of 2 or more hours and should be avoided by those with stomach deficiency or damp phlegm.